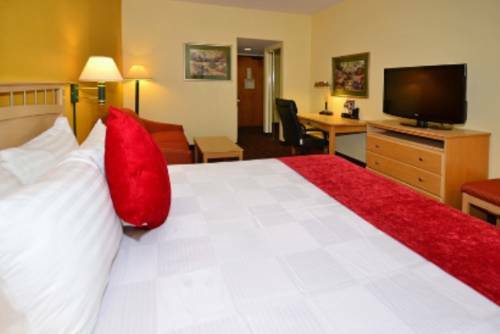 Experience Northern California from this comfortable and convenient San Jose hotel, located just minutes from popular attractions like HP Pavilion and the Winchester Mystery House. Located just off Highway 101, the Best Western Lanai Garden Inn & Suites makes it easy to explore the bustling city of San Jose and surrounding areas. Cheer on the San Jose Sharks at the nearby HP Pavilion or enjoy the oddities of the world-famous Winchester Mystery House. Families staying at this Northern California hotel can get their thrills at Raging Waters Water Park or California's Great America Amusement Park, or make a day of visiting San Francisco's Golden Gate Bridge, Ghirardelli Square and Fisherman's Wharf. There are also an abundance of dining and shopping options, like the East Ridge Mall, within minutes of the property. Also known as the Capitol of Silicon Valley, San Jose is home to many tech and manufacturing giants, including IBM, Google, Facebook, Cisco, GE, NASA and Ericsson, Inc. Our business guests appreciate the close proximity to these and other area attractions, like San Jose State University, the San Jose McEnery Convention Center and the San Jose Fairgrounds. Just eight miles from the San Jose International Airport, it's easy to come and go from this San Jose hotel. The Best Western Lanai Garden Inn & Suites offers the friendly customer service and comfortable accommodations guests have come to expect from Best Western. This San Jose hotel offers well-appointed guest rooms and suites, each complete with cable satellite television with HBO and free wireless high-speed Internet access. Hotel guests will wake each morning to a complimentary full breakfast featuring fresh Belgian waffles, before enjoying an array of amenities such as an outdoor swimming pool and a business center. The Best Western Lanai Garden Inn & Suites is proud to offer superior customer service and a convenient location in San Jose. Make a reservation today and save! Enjoy your stay. From: Downtown San Jose. Take Highway 87 South to Curtner Avenue. Turn left onto Curtner Avenue and Curtner Avenue will become Tully Road. Turn left onto Lanai Avenue. The entrance to the Best Western Lanai Garden Inn & Suites is on the left. From: Highway 101 South. Go to Tully Road. Head east on Tully Road and turn left onto Lanai Avenue. The entrance to the Best Western Lanai Garden Inn & Suites is on the left. From: Los Angeles. Head east on Tully Road, turn left onto Lanai Avenue. The entrance to the Best Western Lanai Garden Inn & Suites is on the left.